Moog_Ladder is a faithful emulation of the legendary Moog Ladder Filter found on Moog's Minimoog Synthesizers. Additionally we have stopped short of allowing the filter types to self-oscillate due to the delay-flushing nature of the algorithm used. 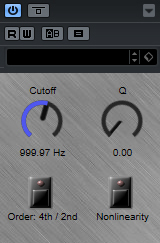 Also, a word of warning: At high Q levels the filter will resonate at higher volumes than 0dBFS and may result in hard-clipping distortion unless your track input/output gain is suitably adjusted. We may integrate a volume trimming option at some future date to combat this, but for the time being use your better judgement and your ears! Our plugin is a modified version of an algorithm designed by Will Pirkle. We used RackAFX and Visual Studio to build the VST3 binary. At some point we may port the algorithm to JUCE for a snazzier GUI. Detailed information on the filter's algorithm design can be found within the following PDF file here.